Geysers are some of the most unusual geologic phenomena in the world. They are incredible natural fountains that can shoot boiling hot water and steam hundreds of feet into the sky in violent eruptions. While most geyser eruptions last only a few minutes, some last for days. Some geysers almost never stop. Others erupt violently, then stay dormant for years or even decades. While geysers are rare (there are less than 700 known geysers in the world) they are not impossible for the average person to observe. They exist on every continent in the world, except Antarctica. The premiere place to see geysers, however, is Yellowstone National Park in the United States. Yellowstone is home to more than half of all the geysers on planet Earth. 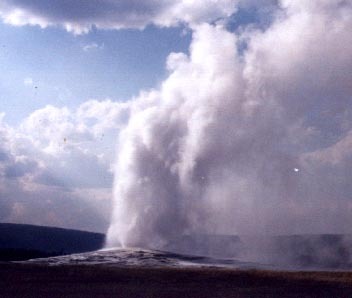 Technically the U.S. Geological Survey defines a geyser as: A hot spring characterized by intermittent discharge of water ejected turbulently and accomplished by a vapor phase. What makes a geyser act the way it does? In order for a geyser to exist, there are four specific conditions that must be met. First, there must be an abundant supply of surface water over a long period of time. It is estimated that Yellowstone's geysers discharge a staggering seventy-million gallons of water a day. The water a geyser ejects comes from snow and rain. When precipitation hits the ground, most of it runs off into rivers and streams. A small portion, perhaps five percent, soaks into the ground. Moving slowly through tiny cracks it finds its way into the underground tunnels that make up the plumbing of a geyser, then is shot to the surface during an eruption. Travel from the surface down through the rock and out through a geyser eruption can take 500 years. Water we see today shooting out of geysers fell from the sky in the time of Columbus. Secondly, there must be a volcanic heat source. 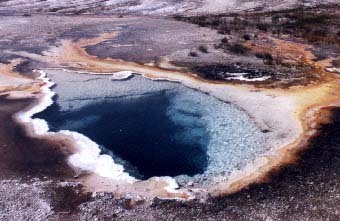 All geyser field sites are above recently active volcanic areas. The surface water works its way down to a depth of around 7,000 feet where it meets up with hot rocks. The water is heated up to 500 degrees Fahrenheit or more, but cannot turn into steam because of the pressure it is under. Though the water is hot and under pressure it would never be ejected from geysers with such tremendous force if it were not for the special quality of the rocks in the geyser fields. The rocks produce a material called geyserite. Geyserite, which is the third necessary condition, is mostly silicon dioxide, is dissolved from the rocks and deposited on the walls of the geyser's plumbing system and on the surface around the geyser. The deposits make the channels carrying the water up to the surface pressure-tight. This allows the pressure to be carried all the way to the top and not be leaked out into the loose gravel, soil or sand that are normally under the geyser fields. The final condition needed to produce a geyser is a plumbing system below it with a special shape. All springs must have a set of channels below them that allow water to flow to the surface. In a geyser there must be a constriction at some point near the top. The water sitting in this narrow spot acts as a valve or lid that allows pressure to build up in the water below. When enough pressure builds up to overcome the constriction, the geyser erupts. The need for the right combination of conditions: abundant water, volcanic heat, geyserite and a special underground shape, are why geysers are so rare. If there is heat, but not enough water a fumarole appears. A fumarole is a steam vent. There is so little water in this type of hot spring that while coming to the surface it boils away, and all that you see is a hole in the ground with steam coming out of it, often accompanied by a roaring or rushing sound. Fumaroles often have the smell of "rotten eggs" because small amounts of hydrogen sulfide get mixed in with the steam. A fumarole that comes up in a wet surface area can become a mud pot. As the steam bubbles up through the water, the hydrogen coming up with the steam reacts with the water to form sulfuric acid. This melts the surrounding rock to turn the water into a muddy clay. Mud pots bubble and can throw lumps of clay for some distance when they are active. If heat, geyserite and water are present, but not the right shape, you can get a simple hot spring. Without the constriction at the top of the spring's plumbing system, the boiling water simply flows up to the surface and gently into a pool. Very hot springs are extremely clear as the water is pure and too hot to support the growth of algae or most bacteria as a normal stagnant pond would. While the water is pure, it is not recommended for drinking as small amounts of dissolved minerals, such as arsenic and sulfur, may be present. Most pools have a deep blue color caused by the absorption of all other colors of the light spectrum by the water. Pools can sometimes turn into geysers and visa versa when conditions change. Sometimes a hot spring only known to be a pool will surprise watchers when it erupts and turns into a geyser without warning, though such events are rare. Probably the most famous geyser in the world is Old Faithful at Yellowstone National Park. It was named by members of the Washburn Expedition of 1870 because it is the most frequently erupting and predictable of the big geysers. Old Faithful sends up 8,400 gallons as high as 184 feet on an average of every 85 minutes. It's a "cone" type geyser, which means that the geyserite deposited over the centuries by Old Faithful has created a cone shape. By measuring geyserite deposits on the cone and carbon-dating pieces of wood caught in the geyserite, scientists have estimated that Old Faithful is roughly 300 years old. Experts figure that geyserite formations grow at a rate of less than one inch per 100 years. Before Old Faithful existed as a geyser it was a regular hot spring for several hundred years. Further examination of the area around it indicates there may have been previous geysers and hot springs on the site. The oldest geyser in the world is thought to be Castle Geyser, which is located only short walk from Old Faithful. The size of its cone, in the shape that reminds people of a castle, indicates that it may be somewhere between 5,000 and 40,000 years old. Despite its age, Castle still gives spectators a good show by erupting every 10 to 12 hours for almost as long as an hour. 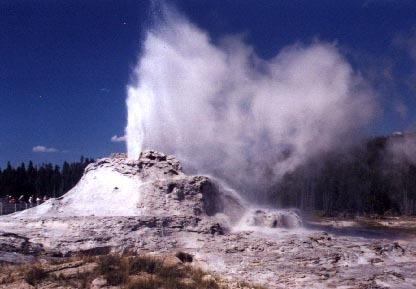 In addition to the "cone" style of geyser, there is a "fountain" type of geyser. In a "cone" geyser, the geyserite has formed a type of nozzle near the surface. This tends to make the "cone" geysers erupt by sending a column of water to a great height. In a fountain-type geyser there is an open crater that fills with water before or during the eruption. These geysers produce an eruption where the water and steam come in bursts and water is sprayed around in all directions instead of creating a single column. In both types of geysers the same mechanism causes the eruption. Water flowing into the geyser's plumbing system is superheated by the hot volcanic rock deep below the surface. It reaches a boiling point and wants to turn to steam, but it can't. When water turns to steam it greatly increases in volume (This is the same principle by which steam engines work). The pressure of the water in the plumbing system above keeps the water from expanding. Eventually the pressure builds to a point where the water in the top can no longer keep the superheated water below from turning to steam. As it does, it pushes the water out of the top of the geysers starting the eruption. Since there is less water above after that, there is less pressure below allowing more of the superheated water to turn to steam. This pushes the eruption further along. The eruption continues until all the water is pushed out. The expulsion of the water may be followed by a period where only steam escapes from the geyser. Steamboat geyser, the largest geyser in the world, that can throw water 300 feet into the air, follows its water phase with phase where steam roars out of it for hours. Geologically speaking, no geyser exists for very long. The dynamics of the geothermal systems that drive them are always changing. An example of this is Porkchop Geyser at the Norris geyser basin in Yellowstone. Originally it was a small hot spring that occasionally erupted. Slowly it sealed itself closed with geyserite so that pressure build up and in 1985 it started erupting continuously. Pressure continued to built up so much that in 1989 it exploded. The explosion turned the geyser back into a small hot spring that is now it working on sealing itself up again. Earthquakes often change the function of a geyser. In 1959 when an earthquake hit Hebgen Lake, Montana, near Yellowstone, many geysers went off simultaneously, often with heights and durations never seen before. While most of the geysers resumed their normal activity in a few weeks, some were changed forever. plugged up the geyser's plumbing and now its eruptions rise barely a foot high. Another geyser in California's Napa valley was foolishly capped to provide hot water heat for a house. More recently, attempts to tap geothermal energy for power have also destroyed some geysers. Power plants in New Zealand and Nevada have killed geysers as far away as twenty-five miles. Hopefully, future geothermal power plants will be planned so that there is no chance of the loss of any more of these natural wonders. If future generations are to enjoy these unique displays of nature, we must take great care to preserve them. To see other geyser-related phenomena click to A Gallery of Geyser Field Formations.